Perfumer Mandy Aftel of indie natural line Aftelier calls her new Candide "a bright, uplifting floral, expressing its theme of optimism through sublime jasmine and age-old frankincense". I'll second the description. This is a resolutely happy scent — just the sort of thing to add some cheer to a dreary winter day — with a simply lovely citrus opening (blood orange and grapefruit) that lingers far longer than you'd expect from an all-natural fragrance, and then some. It's juicy and bright, and sweetish in that citrus jam sort of way that doesn't give you a toothache. The jasmine is slightly indolic but not too dirty,1 and the incense is light and airy. Candide has knocked Aftelier's Cepes and Tuberose into second-favorite status, although I tried Cepes again this week, and in a perfect world I'd have piles of money and own bottles of both. It's Candide in particular I'd like to bathe in, though: it's that happy. Of course I don't have piles of money, and we all know that indie natural does not come cheap. Still, given the way niche prices are going these days, Aftelier no longer induces sticker shock. Candide is not a heavy scent, but it's full-bodied enough to wear in the winter, and I should think it would be easy enough to wear year-round. The lasting power for the Parfum is about what you'd expect — a few hours. I have not tried the Eau de Parfum, but that is the one that will go on my buy list. Aftelier Candide features notes of black pepper, blood orange, pink grapefruit, jasmine grandiflorum, Moroccan rose absolute, frankincense, oppopanax absolute and myrrh. It is available in 2 ml Parfum mini (above center, $45), 1/4 oz Parfum (above left, $150, comes with 2 ml mini kit) or 30 ml Eau de Parfum (above right, $150). 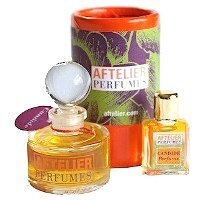 For buying information, see the listing for Aftelier under Perfume Houses. 1. Although as I've noted before, my tolerance for indoles seems to be running high these days. If you've tried and it and found it more than a little indolic, do comment! I totally concur with your review Robin! I love it as well. I did not find it too indolic in the slightest. Just enough to make it full-bodied and well rounded. Candide sounds lovely! Thanks for the review and for a new one to add to the “To Try” list. That reminds me. I’ve been wanting a bottle of another happy fragrance, Mona d’Orio’s Jabu, for a long time. And it’s now available in the US! Ack — I think I knew that somebody had picked up the MdO line, but now I’ve forgotten who it was. Or maybe I never knew. Who was it? I believe luckyscent just picked it up, but Aedes has carried it for some time now. Yes, LuckyScent. Didn’t know about Aedes having it, though. Thanks, Rictor07! I can live with $150 for the EdP, but not for the 1/4 oz Parfum…which is pretty silly of me since for all I know the Parfum is “worth” more. I know! It’s all perspective. Tiny bottle vs. large bottle. Large bottle, regardless of what’s in it, seems like a better buy!? It’s a more satisfying buy, anyway…and I like to spray, so it will make me happier. I’m with you there. I abhor dabbing. So, I gotta know: raspberry? Also, I’m still surprised you didn’t get indoles from Sarrasins. Old territory but it smells so animalistic I’d think PETA would get PO’d. It is a very full, juicy citrus…jammy but not too jammy. I think what Mandy Aftel said was there wasn’t a raspberry note but there was a raspberry nuance? That’s probably accurate, I don’t know…I certainly didn’t think of raspberry but I don’t have that sensitive a nose. But I do promise I can smell indoles, at least sometimes! In fact Aftelier makes (or used to make, many years ago when I was just starting to read MakeupAlley, I think it was the first Aftelier scent I ever smelled) a very indolic perfume, I found it almost shocking — but now offhand I can’t remember what it was. Everyone else says Sarrasins is indolic so it must be. Oh this sounds very nice! Now you review this! Wish you would have reviewed before their sale. I wonder if they still are. The sale was only on their samples…admit that would’ve helped though. This sounds so lovely and like the perfect dreary weather pick me up. I haven’t taken the plunge with Aftelier’s line yet – something to look forward to. I really like the way she packages her items too. It’s funny that you mentioned the Cepes and Tuberose here – I just read something about that one earlier today and I’m really interested to try that one also. The packaging is also cheerful, no? I like the EdP bottle. They sound so very good…but I seldom have much luck with the naturals….and besides—2 ml is a sample….not a bottle in itself. I do have sticker shock with these. 2ml for $45 ? wow. You do have a point there DD. The 2 ml is hard to get over, although the other way to look at it is that it IS parfum concentration…that price is not out of line w/ what others charge for parfum (although in all truth not many niche lines do parfum these days). A little goes a long way with these, though. 2 ml is not much, but it could last a while and let you know for sure you wanted to spring for a bottle. She has a 3-minis for $125 offering, which is a little bit of savings. Yeah, that upset a lot of people when I announced it. I admit it isn’t something that matters to me either way. Perhaps she should have called it Pangloss! and maybe I’m confused but isn’t ‘candide’, or something similar ALSO the name of a venereal disease of some kind? or sorry, was that the SDDs? Dont remember too well! Just dabbed a little on from my new sample set. My first instinct was “PEZ!! !” and I laughed out loud. Close up, very pezzy, or maybe more like Tang, which is kind of fun, but the sillage is where the jasmine peeks through for me. I am very much enjoying trying her line and am glad she put her samples on sale. So far the Honey Blossom that she created as part of her project with Andy Tauer is The One. Pez sounds exciting to me. Yes, it is pretty fun. But maybe not $20+/ml fun. No, I wouldn’t pay that for Pez either! Thank you Robin for this review. i have such a fondness for the wonderful people that write comments on your blog. All of you were so helpful to me with your insightful suggestions when I re-designed my website earlier this year. I included so many of your suggestions. Please feel free to ask me any questions I will check back. I just received this–it’s lovely! One thing though (not necessarily “though” in a bad way, just different than other reviewers), I find that the incense comes to the fore fairly quickly and prevalently. It complements the orange and jasmine quite nicely, and does indeed fill them out in an all-season kind of way. I honestly get no black pepper, but that could just be me (sad though, because I love pepperiness!). Interesting…I wouldn’t mind more pepper either, although I do love it the way it is.